The Luxar LX-20SP Novapulse is a high-quality CO2 surgical laser and it is the most powerful and versatile model in the Luxar line. If you are looking for an affordable CO2 surgical laser system, then you need to give strong consideration to the Luxar LX-20SP Novapulse. This is one of several surgical lasers manufactured by Luxar and this is their top of the line model. It offers the most power and it has more than 100 pre-programmed pulse modes. Even though you can find newer models on the market today, the Luxar LX-20SP Novapulse still stacks up very well against those models, especially when you consider its value. With a surgical laser system like the Luxar LX-20SP Novapulse you can treat patients faster and with less pain and recovery time as compared to traditional surgical methods. If you are looking for the best price on a used Luxar LX-20SP Novapulse system, contact UsedCosmetic.com today. 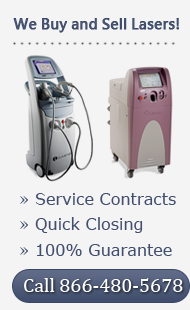 UsedCosmetic.com has the lowest prices on used surgical lasers, but that doesn’t mean you have to settle for anything other than quality, reliable equipment. Every laser we sell has been professionally reconditioned and tested to make sure it meets or exceeds the original manufacturer’s specifications. Plus we back up every system we sell with a 100% satisfaction guarantee. There is simply no reason to buy a pre-owned surgical laser from anyone else. We carry a large inventory of used surgical lasers and Luxar equipment, so contact us right now for the best deal on a Luxar LX-20SP Novapulse. There is no obligation at all to request pricing details or to ask for more information about this model.